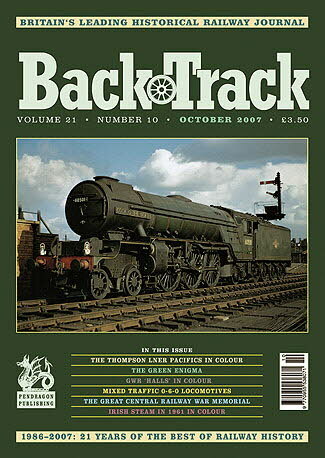 Railway Magazine | BackTrack Oct 2007 journal from Pendragon Publishing. Third rail on the Wirral - colour feature by Tom Heavyside on the LMS-built electric trains on the lines from Liverpool to the Wirral. The Great Central Railway War Memorial - Ken Grainger follows the chequered history of the 1914-18 war memorial at Sheffield Victoria station. Travelling light in Kent - three colour photos of the locomotives of the East Kent and Kent & East Sussex light railways. The Green Enigma - R.A.S. Hennessey raises the 'green agenda' and the relationship of environmental issues to railway history. Railways for Posterity - Part Three - A.J. Mullay concludes his series with a look at the pioneering 'heritage' lines and a few successes and failures of the wider preservation movement. Mr. Thompson's Pacifics - a colour feature on the often controversial 4-6-2s produced by Edward Thompson for the LNER. The Bombing of Britain's Railways 1939-45 - In Part 3 of his series John W.E. Helm covers the period from June 1941 to May 1944 (including the 'Baedeker' raids). A visit to Ireland in 1961 - Roy Cole's colour photographs of Irish steam. Good and Faithful Servant - Part One - Michael Rutherford looks at the development of the ubiquitous British 0-6-0 locomotive. Beheld at Bolton - two 1965 colour photographs at Bolton Trinity Street station. The Bridgend Incident - Charles Methven describes a head-on collision on the North British Railway near Glasgow. The Happy Wanderers - Noel Coates looks at ex-Lancashire & Yorkshire Railway locos which were sent to work away from their home on the Central Division of the LMSR.